Wedding Dresses Dry Cleaning Department! 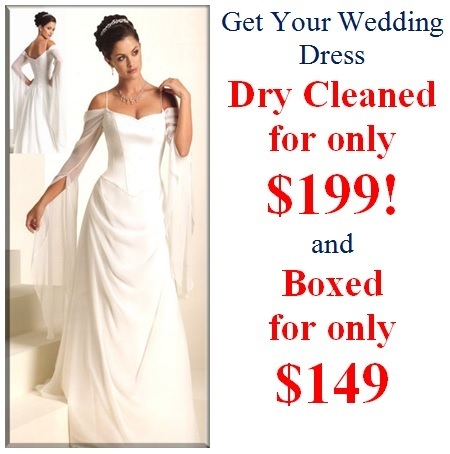 Get Your Wedding Dress Dry Cleaned for only $199! and BOX your Wedding Gown for only $149! Best for Bride Boutique team understands how important your wedding dress is to you and we take pride in the results we achieve. Your wedding gown is the most precious gown you will ever wear. So trust it to a professional. We ensure that your gown is dry cleaned to the highest level available. We carefully inspect your wedding dress upon receipt and look for any marks or stains and any small damage that may have occured on your special day. The fibre content of the dress is then checked to ensure the correct cleaning method is used. Once the dress is ready we invite you inspect your dress, after which you can either take your dress as it is or have it boxed. The result is a gown that looks no different from the day it was purchased. 1. Cleaning and preserving your bridal dress as soon as possible, will ensure it remains in the best possible condition. Ideally, your dress should be cleaned within days or weeks of your wedding. 2. The longer stains and soil are left on your dress, the greater the probability of them becoming permanent. 3. Avoid rubbing stains, if you spill something on your dress, absorb with blotter paper gently as rubbing can damage the fabric permanently. 4. Check the dress periodically while in storage, in case the dress is deteriorating through inappropriate storage. It's good to refold the dress to prevent permanent creases. Packaging heirloom garments can be done at home. Before doing so, check garments carefully in sunlight for soils and stains, even if they have been professionally cleaned. Look for soil, stains, or the presence of wrinkles that have been pressed in. Both stains and wrinkles may be impossible to remove at a later date. If you pack the gown yourself, use a large box about one-third of the length of the front of your gown. Line the box with tissue and lay the gown over it face down. Make sure you have the gown centered in the box and that the part that is face down is spread flat so there are no creases or folds. If possible, remove fabric-covered metal buttons, rubberized dress shields, or foam padding. These items can oxidize, rust, or deteriorate and result in damage to fabric over time. Beginning at the side seams, fold the skirt lengthwise over bunched tissue until the skirt is no wider than the box. Then add more tissue and fold the bottom of skirt into the box. Add still more tissue and fold the top of the gown over into the box. The top of the gown will now be facing up. Now use still more tissue to stuff the bodice and cushion anything else such as bows or sleeves that should be protected. When you are finished, the dress should not move, even if you shake the box. In general, gowns with sheer bodices, heavily beaded areas, heavy skirts or trains should be stored horizontally to minimize the effect of gravity. On the other hand, vertical storage reduces wrinkling, but can weaken shoulders or bodice since the full weight of the garment hangs from these areas. Select an area with minimal temperature and humidity fluctuations, good air circulation and a minimum of light. It is always better to use interior closet in the living area of your home rather than the basement or attic. Inspect your dress every year. Take your dress out of storage, carefully opening and handling it. Check for evidence of unremoved soils darkening. This inspection should be done whether you packaged the gown by yourself or had it packaged commercially.